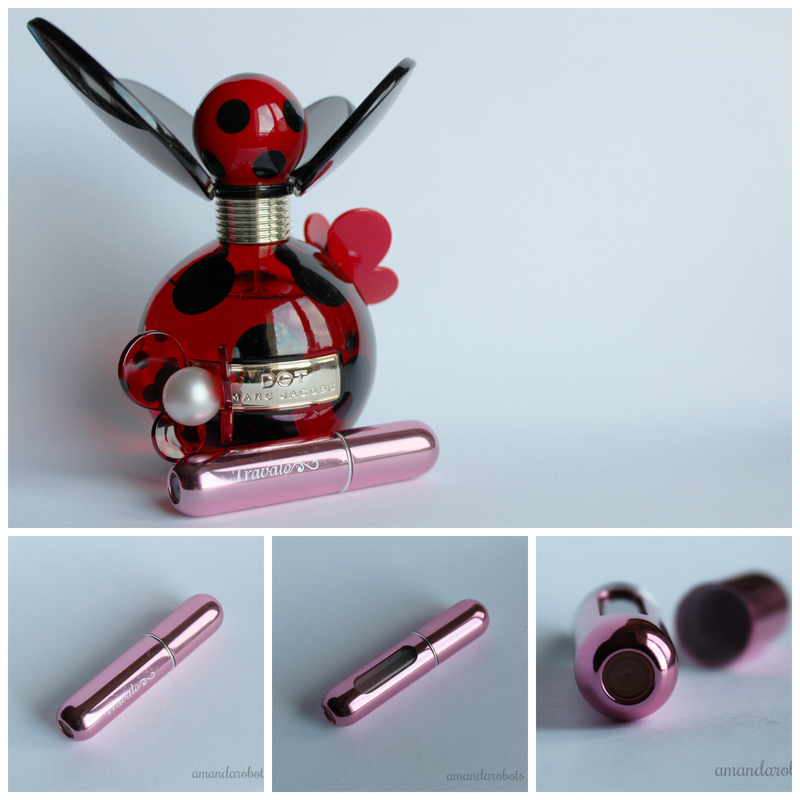 Review: Marc Jacobs Dot & Travalo Atomizer – amandarobots. When Dot came out, however, I smelled it and wasn’t a fan. Then I got a little sample from Sephora…and it started to grow on me. Whenever I went into a department store, I would spray it on me. And pretty soon I decided that I wanted it. The notes in it, as described by Sephora, are “red berries, dragonfruit, honeysuckle, jasmine, coconut water, orange blossom, vanilla, driftwood, [and] musk”. I don’t know about you, but notes never help me describe a smell. Normally I gravitate to fragrances that smell like baked goods — vanilla-y, cinnamon-y, sugary, bag-of-Skittles goodness. Dot doesn’t smell like that. It’s definitely got more floral, but it isn’t overly floral. The musk is definitely there, and it works to counteract the sweeter berry and vanilla smells. The result is a not-quite-edible, not-quite-floral scent. And do I ever love it! Unfortunately, though, one of my issues is that I frequently rush out of the house in the morning and forget to put it on. Until recently, the Dot rollerball hadn’t come out yet (it’s now available at Sephora for $30, but there’s no way I’m spending that when I’ve already got the full size!). It sounds like a Harry Potter spell and is probably as brilliant as one, too. It’s an atomizer (a little spray doodad for fragrances) but it’s not just an ordinary one. It’s major selling-point and edge on the competition is how easy it is to use. You just pop the spray nozzle off of your fragrance, set the Travalo on top, and give it a few pumps. The one-way valve-hole thing on the bottom (pictured above) accepts fragrance when you do this, but doesn’t leak it out. There’s even a little window (pictured above) that shows you how full your Travalo is. Brilliant. What about your other fragrances, you ask? Well, the Travalo people want you to buy several Travalos and keep one for every fragrance you have. However, they aren’t cheap — I got mine for about $10 when they came out. Also, I probably have more than five fragrances and only two Travalos. So there is a way to clean it out. You can take an empty travel spray bottle, fill it with rubbing alcohol diluted with water, and pump it into your (previously fragrance-filled) Travalo. Then you can spritz the alcohol out of your Travalo and into a sink or paper towel. Do this a few times and the Travalo won’t be completely clean, but it’ll be clean enough to start fresh with a new fragrance. The scent fades even more as you use it!